I feel like the early 2000's will filled with quite a number of amusing or at least memorable LGBT movies, although I can't figure out why. Most of them are harldy great movies, but at least they had a lot of heart and didn't always feel overly dark all the time. I don't even go hunting for movies from this period - I just find out later on that the movie came from that time and I just chuckle to myself. Mambo Italiano is a strange little comedy since it's all about Italian immigrants based in Canada. I'm not sure what that's supposed to imply right off the bat, but the end result certainly felt a lot more Italian than it did Canadian - but I could be totally wrong in that assessment. The movie's core plot wasn't too bad and it certainly had it's funny moments. What it did suffer from was rather borderline acting and a lack of decent character development throughout the movie. Things just seem to happen because the plot requires they happen and not necessarily because it feels right. But more on this later in the review. 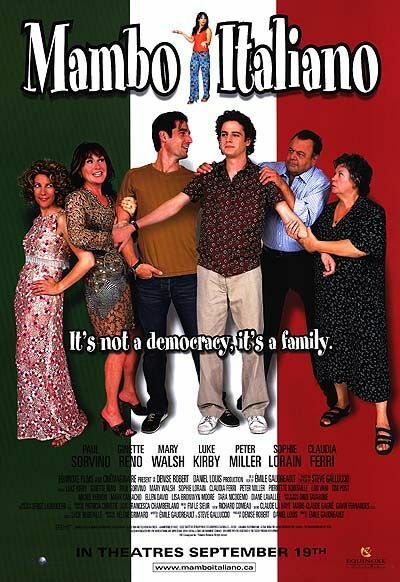 Synopsis: Mambo Italiano is a 2003 LGBT comedy directed by Émile Gaudreault, who also co-wrote the screenplay together with Steve Galluccio. The movie was based on Galluccino's play of the same name. Angelo Barberini (Luke Kirby) is the son of Italian immigrants Gino (Paul Sorvino) and Maria (Ginette Reno). Angelo still lives with his parents, as all good Italian sons should, but eventually manages to work up the nerve to finally move out and strike out on his own. Around the same time he bumps into Nino Paventi (Peter Miller), someone who used to bully him in his school days. Now a policeman, Nino turns out to be a closeted gay man like Angelo and the two eventually get into a relationship. So as the two carry on a sort of a relationship in secret from their respective families, although both are constantly getting offers of setup dates and such from family members. The two continue to keep up their little charade, although we all know that something's going to give sooner or later. And when Nino's family makes a pretty serious bit to set him up with Pina (Sophie Lorain), it's hard to Nino to resist family pressure. Other reviewers have pointed out how the movie was set in Montreal's Petite Italie neighborhood, although I can't vouch for the accuracy of this statement. It doesn't feel like the location had a distinct character on its own - the fact that they were actually in Canada was not immediately apparent to me outside of mentions in the dialog. The biggest challenge of this movie is the lack of chemistry between Angelo and Nino coupled with the pacing of the story. The pacing in itself isn't bad, don't get me wrong. But without sufficient on-screen demonstrations of why the two fall in love and become a couple , the pacing then feels rushed. One day they're remembering past bullying. The next scene we see them practically sharing a home for the most part, It all just ends up feeling a little insincere and that's a pain for a movie with a need for a strong relationship to center it. The movie plays on a lot of stereotypes of Italian families, which is naturally expected in this situation. More and more though I feel a lot of these supposed stereotypes aren't all that limited to Italian families since we see similar tropes for Asian families and other ones which strong ties to their racial identity. The end result is a movie that tries to present a very particular view of what it means to be Italian with a side dose of a gay relationship. There are the usual revelations related to each of them figuring out when to come out and the almost obligatory break-up in the middle of the movie. And in that regard we don't see too much innovation in the movie. Mambo Italiano has a charm of its own and I suppose works better for folks who don't care too much how well the actors perform. If you just take the plot as it comes and avoid stressing about flat acting, then the movie remains fairly decent. Thus the movie as a whole gets 3 rule set by Angel's parents out of a possible 5.